in our attempt to introduce different projects dealing with ants and to create a forum for presenting new projects and for discussion, we present a project by Paul van Mele and Nguyen Thi Thu Cuc on how to use Weaver Ants as a natural insect remedy. Our website serves as a download mirror for the publications as wll, so please spread the word! Large ant colonies need much food to rear their larvae, thus workers of predaceous species collect an astonishing amount of prey from their surrounding. Ants' colonial life and their steady hunger for protein allow their use as agents for biological control in human tree crops, hence reducing the need for agrochemicals that endanger the environment and human health. In China weaver ants have been used in crop protection already since thousands of years. Dr Paul Van Mele, technology transfer specialist at WARDA, and Dr Nguyen Thi Thu Cuc, an entomologist at the Cantho University, have written a book that provides practical tips to make optimal use of the beneficial weaver ant, based on improved insights of underlying ecological principles. They combined the rich sources of scientific and farmers' knowledge into an attractive and colorful manual. It will appeal in particular to university students, NGO workers, extension staff and all those engaged in communicating science to farmers. Read more about the life history and management of weaver ants and how they protect the crop of the farmers; learn about ant husbandry and how to protect from ant bites. Antbase.net is a download mirror for the second edition of this most informative booklet that is available in English, Bahasa Indonesia and Vietnamese. 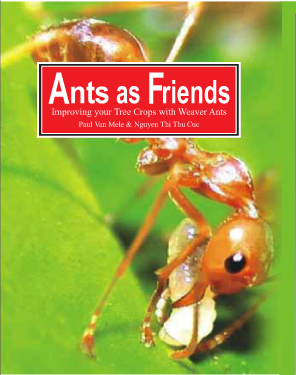 Download your copy today and spread the news of beneficial ants to your colleagues.